For other uses, see Daily News. For the newspaper published between 1855 and 1906, see New York Daily News (19th century). The New York Daily News, officially titled Daily News, is an American newspaper based in New York City. As of May 2016[update], it was the ninth-most widely circulated daily newspaper in the United States. It was founded in 1919, and was the first U.S. daily printed in tabloid format. It reached its peak circulation in 1947, at 2.4 million copies a day. When Patterson and McCormick could not agree on the editorial content of the Chicago paper, the two cousins decided at a meeting in Paris that Patterson would work on the project of launching a Tribune-owned newspaper in New York. On his way back, Patterson met with Alfred Harmsworth, who was the Viscount Northcliffe and publisher of the Daily Mirror, London’s tabloid newspaper. 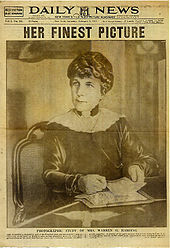 Impressed with the advantages of a tabloid, Patterson launched the Daily News on June 26, 1919. The Daily News was not an immediate success, and by August 1919, the paper’s circulation had dropped to 26,625. Still, New York’s many subway commuters found the tabloid format easier to handle, and readership steadily grew. By the time of the paper’s first anniversary in June 1920, circulation was over 100,000 and by 1925, over a million. Circulation reached its peak in 1947, at 2.4 million daily and 4.7 million on Sunday. The Daily News carried the slogan “New York’s Picture Newspaper” from 1920 to 1991, for its emphasis on photographs, and a camera has been part of the newspaper’s logo from day one. The paper’s later slogan, developed from a 1985 ad campaign, is “New York’s Hometown Newspaper”, while another has been “The Eyes, the Ears, the Honest Voice of New York”. The Daily News continues to include large and prominent photographs, for news, entertainment and sports, as well as intense city news coverage, celebrity gossip, classified ads, comics, a sports section, and an opinion section. News-gathering operations were, for a time, organized using two-way radios operating on 173.3250 MHz (radio station KEA 871), allowing the assignment desk to communicate with its personnel who utilized a fleet of “radio cars”. The paper briefly published a Monday-Friday afternoon counterpart, Daily News Tonight, between August 19, 1980 and August 28, 1981; this competed with the New York Post, which had earlier launched a morning edition to complement its evening newspaper. Occasional “P.M. Editions” were published as extras in 1991, during the brief tenure of Robert Maxwell as publisher. In 1982, and again in the early 1990s during a newspaper strike, the Daily News almost went out of business. In the 1982 instance, the parent Tribune Company offered the tabloid up for sale. In 1991, millionaire Robert Maxwell offered financial assistance to the News to help it stay in business. When Maxwell died shortly thereafter, the News seceded from his publishing empire, which eventually splintered under questions about whether Maxwell had the financial backing to sustain it. After Maxwell’s death in 1991, the paper was held together in bankruptcy by existing management, led by editor James Willse, who became interim publisher after buying the paper from Tribune. Mort Zuckerman bought the paper in 1993. From its founding until 1991, the Daily News was owned by the Tribune Company. In 1948, the News established WPIX (Channel 11 in New York City), whose call letters were based on the News's nickname of “New York’s Picture Newspaper”; and later bought what became WPIX-FM, which is now known as WFAN-FM. The television station became a Tribune property outright in 1991, and remains in the former Daily News Building; the radio station was purchased by Emmis Communications, and since 2014 has been owned by CBS Radio as an FM simulcast of its AM namesake. On September 4, 2017, tronc, the publishing operations of the former Tribune Company (which had spun out its publishing assets to separate them from its broadcast assets), announced that it had acquired the Daily News. Tronc had bought the Daily News for $1, assuming “operational and pension liabilities”. By the time of purchase, circulation had dropped to 200,000 on weekdays and 260,000 on Sundays. In July 2018, tronc fired half of the paper’s editorial staff, including the editor-in-chief, Jim Rich. Rich was replaced by Robert York, Publisher and Editor-in-Chief of tronc-owned The Morning Call in Allentown, Pennsylvania. The paper’s social media staff were included in the cut; images and memes that were later deleted were posted on its Twitter feed. New York Times journalist Alan Feuer said the Daily News focuses heavily on “deep sourcing and doorstep reporting”, providing city-centered “crime reportage and hard-hitting coverage of public issues […] rather than portraying New York through the partisan divide between liberals and conservatives”. According to Feuer, the paper is known for “speaking to and for the city’s working class” and for “its crusades against municipal misconduct”. The New York Times has described the Daily News's editorial stance as “flexibly centrist” with a “high-minded, if populist, legacy”. The News endorsed Republican George W. Bush in the 2004 presidential election, Democrat Barack Obama in 2008, Republican Mitt Romney in 2012, and Democrat Hillary Clinton in 2016. From its founding, it was based at 23 Park Place, a block from City Hall, and two blocks from Park Row, the traditional home of the city’s newspaper trade. The cramped conditions demanded a much larger space for the growing newspaper. In 1928, a News reporter strapped a small camera to his leg, and shot a photo of Ruth Snyder being executed in the electric chair. The next day’s newspaper carried the headline “DEAD!”. In the year leading up to the 2016 presidential election, the paper’s headlines became more provocative, helping to rejuvenate it and, with more opinionated editorials with the aforementioned headlines, once again demonstrate its place in the city’s media. Following the 2015 San Bernardino shooting, in which 14 people were killed, the paper’s front page displayed “GOD ISN’T FIXING THIS” along with tweets from Republican politicians offering thoughts and prayers. The paper advocated for tighter gun laws, condemning what it described as “empty platitudes and angry rhetoric” rather than action “in response to the ongoing plague of gun violence in our country.” The provocative headline received both praise and criticism. On January 2016, after Republican senator and presidential candidate Ted Cruz of Texas disparaged “New York values” in a Republican primary debate, the News responded with a cover page headline reading “DROP DEAD, TED” and showing the Statue of Liberty giving the middle finger. On December 20, 2016, Daily News columnist Gersh Kuntzman compared the assassination of the Russian Ambassador to Turkey, Andrei Karlov, to the assassination of Nazi German diplomat Ernst vom Rath by Jewish student Herschel Grynszpan, saying “justice has been served.” Russia has demanded an official apology from Daily News. ^ “New York Daily News”. Media Bias/Fact Check. MBFC News. ^ “Top 10 US Daily Newspapers”. Cision. ^ Feuer, Alan (September 27, 2015). “The Daily News Layoffs and Digital Shift May Signal the Tabloid Era’s End”. New York Times. Retrieved July 31, 2018. ^ “New York Daily News”. Company-Histories.com}. Retrieved March 20, 2018. ^ “Clay Felker, founder of New York magazine, dies at age 82”. New York Daily News. 1 July 2008. Retrieved 26 January 2019. ^ “Daily News publishes last Tonight edition”. The New York Times. 29 August 1981. Archived from the original on 26 January 2019. Retrieved 26 January 2019. ^ Pilkington, Ed, “Former NoW editor Colin Myler takes the helm at New York Daily News”, The Guardian, January 4, 2012. Retrieved January 4, 2012. ^ Pompeo, Joe, “Colin Myler leaving the Daily News; Jim Rich to be new EIC”, Politico New York, September 11, 2015. Retrieved December 8, 2015. ^ Ember, Sydney; Sorkin, Andrew Ross (September 4, 2017). “The Daily News, a Distinctive Voice in New York, Is Sold”. The New York Times. ISSN 0362-4331. Retrieved September 5, 2017. ^ Kogan, Rick; Channick, Robert (September 5, 2017). “Tronc acquires New York Daily News”. Chicago Tribune. Archived from the original on June 17, 2018. Retrieved September 5, 2017. ^ Folkenflik, David (July 23, 2018). “Tronc Slashes ‘New York Daily News’ Staff By Half”. ^ “New York Daily News”. Twitter. July 23, 2018. Archived from the original on July 23, 2018. Retrieved July 23, 2018. ^ “New York Daily News cuts half of its newsroom staff”. The Guardian, from Associated Press. July 24, 2018. ^ a b c Feuer, Alan (September 27, 2015). “The Daily News Layoffs and Digital Shift May Signal the Tabloid Era’s End”. The New York Times. Unlike The New York Post, which has veered from left to right, the politics of The Daily News are flexibly centrist..
^ Mahler, Jonathan (January 29, 2016). “Drop Dead? Not the Newly Relevant Daily News”. The New York Times. ^ “NY ‘Daily News’ Endorses Obama — Had Backed Bush in 2004 —and So Does ‘Detroit Free Press’]”. Editor & Publisher. October 18, 2008. ^ “Daily News endorses Obama for President: He has the promise to renew America at home and abroad”. Daily News. October 19, 2008. ^ “Our choice for America’s future: The Daily News endorses Mitt Romney for president”. Daily News (New York). November 4, 2012. Retrieved July 31, 2016. ^ “Daily News Editorial Board says Vote Hillary Clinton: She’s the best choice for President, while Donald Trump represents a clear and present danger to the republic”. Daily News. July 28, 2016. ^ Deichler, Andrew. “Daily News Relocating HQ to 4 New York Plaza”. ^ Myler, Colin (November 5, 2012). “How the Daily News bested Superstorm Sandy: The Daily Planet would be proud”. Daily News. Retrieved July 25, 2013. ^ Pinder, Jeanne B. (June 4, 1993). “Daily News to Shift Printing to Jersey City”. The New York Times. Retrieved December 16, 2011. ^ “Fire damages Daily News printing plant in Jersey City”. The Jersey Journal. January 5, 2008. Retrieved December 16, 2011. ^ Pérez-Peña, Richard (November 17, 2009). “With New Presses, Daily News Is Betting on World of Print”. The New York Times. ^ Erin Carlson (November 17, 2009). “The Daily News Spends $150 Million On New Printing Presses”. Business Insider. Archived from the original on February 21, 2013. Retrieved November 8, 2012. ^ O’Dea, Coleen (December 12, 2011). “Can Urban Transit Hubs Help Revitalize New Jersey’s Cities?”. Jersey City Independent. Retrieved December 16, 2011. … state expects to award the first $41.7 million in credits soon to the Daily News, which is spending $100 million on three new presses at its site in Jersey City. ^ Slattery, Denis (April 10, 2017). “Daily News, ProPublica win Pulitzer Prize”. New York Daily News. Archived from the original on May 17, 2018. Retrieved July 23, 2018. ^ McAlary, Mike (August 13, 2007). “Mike McAlary’s 1997 Pulitzer Prize-winning Abner Louima columns”. New York Daily News. Archived from the original on April 29, 2018. Retrieved July 23, 2018. ^ a b Saltonstall, David (April 16, 2007). “Daily News editorial board wins Pulitzer”. Daily News. Archived from the original on June 12, 2018. Retrieved July 23, 2018. ^ “HistoryWired: A Few of Our Favorite Things”. SI.edu. Retrieved January 4, 2017. ^ Infamous ‘Drop Dead’ Was Never Said by Ford New York Times. December 28, 2006. ^ Peiser, Jaclyn (July 23, 2018). “Daily News Newsroom Cut in Half by Tronc as Top Editor Is Ousted”. New York Times. Retrieved July 31, 2018. ^ “Drop Dead? Not the Newly Relevant Daily News”. New York Times. ^ a b c Chris Cillizza, The New York Daily News’s very provocative front page on the San Bernardino shooting, Washington Post (December 2, 2015). ^ a b Jessica Durando, Daily News’ provokes with cover on Calif. shooting: ‘God isn’t fixing this’, USA Today (December 3, 2015). ^ Ginger Adams Otis, Daily News cover calling out pols’ empty rhetoric after San Bernardino shooting prompts strong responses, New York Daily News (December 3, 2015). ^ David Wright, New York Daily News to Cruz: ‘Drop Dead, Ted’, CNN (January 16, 2016). ^ “Surprise! Ten Years Ago Many Top Newspapers Did Oppose the US War Against Iraq“. The Nation. March 13, 2013. ^ “Peaceniks couldn’t be more wrong”. New York Daily News. March 14, 2003. Archived from the original on July 18, 2018. Retrieved July 23, 2018. ^ Kuntzman, Gersh (December 20, 2016). “Assassination of Russian Ambassador Andrei Karlov was not terrorism, but retribution for Vladimir Putin’s war crimes”. New York Daily News. Archived from the original on July 18, 2018. Retrieved July 23, 2018. ^ “Russian Foreign Ministry demands apology from NY Daily News – spokesperson“. RT. December 22, 2016.